For a while I’ve been working with a customer to deploy a new workspace environment with Microsoft Windows 10. I’ve been in this business for several years and been tuning for a while. I noticed Microsoft Windows 10 tuning takes a bit more work than Microsoft Windows 7 or XP was. I thought perhaps a few articles about this might be handy for others. So the first part is here, creating the virtual machine. First off you need a virtual machine to build a golden image that will at the end of the articles be your template for your VDI environment. I’m using a VMware environment to build the environment but it is applicable to any environment. Explanation: A golden image, perhaps the word is not clear to you, is what we call the template Windows machine you use to deploy your virtual environment. In a Citrix PVS environment, it is the Windows VM that you transfer into a vDisk, in a VMware environment it is the Windows VM that is used to deploy the linked clones. 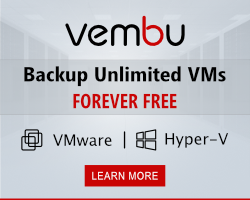 With this, we can start, let’s fire up the vSphere client and connect to the virtual environment. The first step is creating a standard virtual machine, within your hypervisor management console (trying to make it generic) choose “create new virtual machine”. If you get a question for the operating system pick Microsoft Windows 10 (64bit), there is not pick for specific builds, in this part of the process, the build is not important yet. RAM: 4GB is a minimum but as you will see at the end of the article series Windows 10 is hogging resources more than predecessors. NIC: 1 basically, one with a VMXNET3 type of card. Video memory: Set the video memory to the maximum of 128MB and put the number of displays to the number you will have in production. You start with a name, give the machine a name and continue. Next up is the network card, make sure you select a VMXNET3 if you don’t want to experience performance issues on that side. Next up is managing the settings before you start the virtual machine. The basic settings are as shown below, you need to configure this before moving forward. One of the hardware items you can remove is the Floppy drive, pretty sure you don’t need that one anymore. Next up is changing the settings, here it was a VDI for a default desktop pool. I set the memory to 4GB and the CPU to 2. This is enough for most medium to heavy users (medium/heavy in Windows 7 environments that are). I also added the ISO file to install Windows 10, make sure the device status is set to connect at power on… you wouldn’t be the first one to forget that. 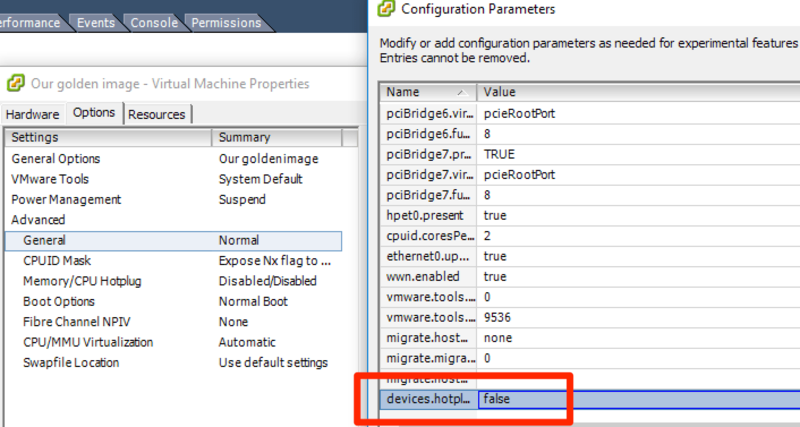 On the tab Options, you find the setting to enable logging, this one is set only after you create the virtual machine. This won’t do much for performance but if it ain’t hurting just switch it off… perhaps it will do a bit. In a virtual machine, by default, you have to option to remove certain NICs and SCSI devices. This would lead to the user losing your network adapter which you don’t want. To make sure this is not possible you need to add the settings of the virtual machine. In a VDI environment, this means you edit the golden image. After you finished with this all, you can start the machine and start installing Windows 10. The machine is ready, there is nothing more to tune at this level in my opinion. You can decide to switch numlock on/off in the bios. Yeah that is one option that I could do there… good one. Now I have a vbs script to set the numlock setting at logon. Pingback: How to install and configure XenDesktop 7.13, including Windows 10 (MCS) virtual desktop | InfraShare.net - Sharing IT Knowledge!